Government authorities or operators in six countries, including a few of the world's biggest economies, have now restricted Huawei Technologies Co. Ltd. in some manner, supposedly out of concern that Chinese vendors are a threat to security. Under apparent pressure from the US, others are said to be weighing their options. A domino effect, as a multitude of countries raise the drawbridge on Chinese suppliers, would seriously curtail Huawei's prospects. Sources: Operators, government authorities, news reports. 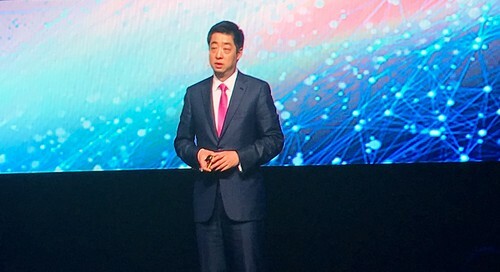 Ken Hu, Huawei's rotating CEO, addresses attendees at his company's Global MBB Forum in London last month. In markets where Huawei's movement is restricted, the big question is how far authorities and customers will go. In the US, Huawei has been effectively banned from serving the major telcos since 2012, when a government report warned them off using Chinese vendors in their networks. This week's move by Japanese authorities could have a similar impact. Reports originating with Japan's Nikkei newspaper indicate that SoftBank Corp. now plans to replace Huawei as a 4G supplier with Ericsson AB (Nasdaq: ERIC) and Nokia Corp. (NYSE: NOK). But what is bad for Huawei might be good for Western rivals such as Ericsson and Nokia. Competition from low-cost Chinese rivals has been a nightmare for the Nordic suppliers since the early years of the millennium. Given suspicions in the US that Chinese companies have ripped off others' intellectual property, there is unlikely to be much sympathy for Huawei and smaller rival ZTE Corp. (Shenzhen: 000063; Hong Kong: 0763) in the vendor community. Long-serving executives may be grinning with Schadenfreude. The deal-makers in those companies will have their eyes on the business the Chinese vendors are losing with BT and others. In Japan, it seems like they have already seen benefits, judging by the reports about SoftBank. Damage could be done in other ways, though. Just as the US stopped ZTE from buying US-made components earlier this year, so China could lock Western equipment makers, including device companies like Apple, out of their supply chains and factories. But throughout international telecom markets, much of the harm may be self-inflicted by local authorities and their bans. Even if they have not fallen in love with Huawei and ZTE, telcos admire their products, their focus on customers' needs, and appreciate the competition they bring. Without it, Ericsson and Nokia would be under little pressure to shape up, and 5G rollout could take longer than planned. For anyone worried that Europe is already well behind the US and China in the 5G race, that is a troubling thought. Just an fyi, Orange said that French government was warning about Huawei risks and said they would not use Huawei for 4G and 5G network builds.